We’d love your help. Let us know what’s wrong with this preview of Twenty Yawns by Jane Smiley. As her mom reads a bedtime story, Lucy drifts off. 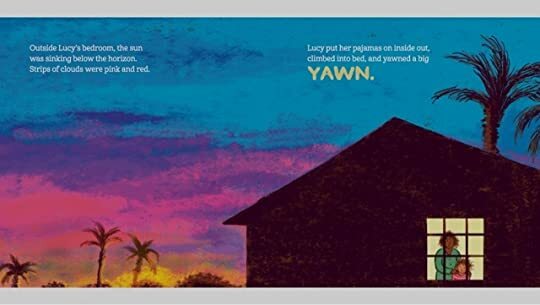 But later, she awakens in a da Featuring lyrical text and beautiful illustrations, this bedtime tale from Pulitzer Prize winner Jane Smiley and Caldecott Honor recipient Lauren Castillo evokes the splashy fun of the beach and the quietude of a moonlit night, with twenty yawns sprinkled in for children to discover and count. To ask other readers questions about Twenty Yawns, please sign up. Why did u right Twenty Yawns? Most novelists don’t want to put readers to sleep, but Jane Smiley hopes you’ll nod off with her next book. “Twenty Yawns” is Smiley’s first picture book. It marks a somnolent shift for the Pulitzer Prize-winning writer, who recently completed her three-volume “Last Hundred Years” trilogy. In an email interview from her home in Carmel Valley, Calif., Smiley said she came up with the idea almost a decade ago when she wanted to add some. . . .
To read the rest of this interview with Jane Smiley, go Most novelists don’t want to put readers to sleep, but Jane Smiley hopes you’ll nod off with her next book. Twenty Yawns is author Jane Smiley’s first picture book. Although she has written five YA novels, this is for young children. She is probably best known for her adult novels, winning the Pulitzer Prize for her novel A Thousand Acres but she also has a rather lengthy list of additional novels, non-fiction, short stories, and YA novels. 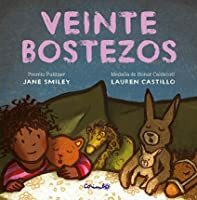 Because, of course, as a children’s book, this will likely be most often read to a child, it’s important that it not be a bore to the parent(s) as much as comforti Twenty Yawns is author Jane Smiley’s first picture book. Although she has written five YA novels, this is for young children. She is probably best known for her adult novels, winning the Pulitzer Prize for her novel A Thousand Acres but she also has a rather lengthy list of additional novels, non-fiction, short stories, and YA novels. Because, of course, as a children’s book, this will likely be most often read to a child, it’s important that it not be a bore to the parent(s) as much as comforting and sleep-inducing for the child. Not that all books are bedtime stories, but Twenty Yawns is most definitely a bedtime story. I loved the illustrations of the second half of the book; the illustrations in the first half didn’t draw me in quite as much. A day at the beach, all that sun and sand tends to tire both children and parents out. An early bedtime is announced by Lucy’s mother before they even leave the beach. At home, as the sun is turning the summer sky shades of purple and pink, Lucy is putting on her pajamas. Once she’s climbed into bed, her mother begins to read her a bedtime story, and midway through, yawns, closes her eyes for just a moment…. and drifts to sleep. But Lucy was wide-awake, especially now! Suddenly realizing she’s without her bear, she slips out of bed to bring her bear to bed, and finds the rest of her collection of toys looking lonely, too. 32 pages. Twenty yawns, enough to have your little ones yawning, themselves. Each year I and my family read and rate all the Goodreads picture book nominees. This one is nominated for 2016. I make a few comments and then add their separate ratings and a comment. There's 15 and this is the second being rated. Supergroup book? National Book Award fiction winner Smiley (1000 Acres), and Castillo, Caldecott Honor winner. Cute. Mixed race family. ALL the animals at bedtime, not just one fave. 3 stars. Tara (my wife): 3 stars. Cute. I liked the aspect Lyra did. Harry (11): 3 star Each year I and my family read and rate all the Goodreads picture book nominees. This one is nominated for 2016. I make a few comments and then add their separate ratings and a comment. There's 15 and this is the second being rated. Harry (11): 3 stars. I yawned when the book said "yawn." Hank (10): 4 stars. I just liked it. What I liked about this book was the artwork and the inclusion of both parents in a black/biracial family. The reason for only the three stars is that there wasn't any kind of lesson learned and it didn't hold my attention for long. I wouldn't probably reread to my own future children. Lucy spent a long time playing at the beach with her mother and father. The three of them played in the waves, dug holes in the sand, and rolled down the dunes. Soon they were all yawning and Mom declared it was a day for early bedtime! As they got ready for bed, everyone was yawning and Lucy’s mom even fell asleep reading the bedtime book. In the middle of the night the moon shone brightly through Lucy’s window and she was suddenly wide awake. She tiptoed out of bed and through the living room Lucy spent a long time playing at the beach with her mother and father. The three of them played in the waves, dug holes in the sand, and rolled down the dunes. Soon they were all yawning and Mom declared it was a day for early bedtime! As they got ready for bed, everyone was yawning and Lucy’s mom even fell asleep reading the bedtime book. In the middle of the night the moon shone brightly through Lucy’s window and she was suddenly wide awake. She tiptoed out of bed and through the living room where her father was asleep in a chair. Lucy was looking for Molasses, her bear. She found not only Molasses but all of her stuffed animals who all wanted to come with her to bed. Once again everyone was yawning, even the pictures on the wall, as Lucy fell asleep with her bed full of stuffed friends. Adorable book...but torture for parents to read!!! 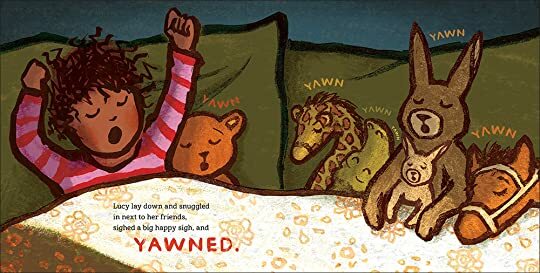 There are so many "yawns" to act out during the story that I find myself exhausted and ready for bed myself after reading it! 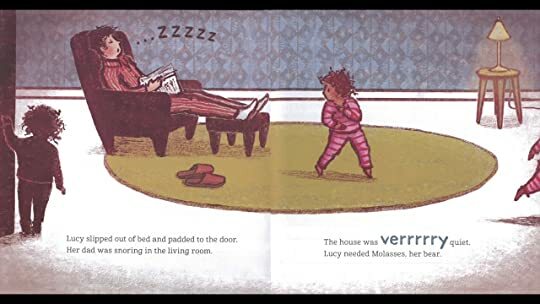 Although Jane Smiley's gentle, sweet story occasionally lacks flow, its bedtime potential is undeniable: I bet you couldn't get through this picturebook without yawning yourself at least once (and in this case I mean it as a compliment!). Finally, I appreciate Castillo's use of simultaneous succession to indicate the movement and passage of time within a Although Jane Smiley's gentle, sweet story occasionally lacks flow, its bedtime potential is undeniable: I bet you couldn't get through this picturebook without yawning yourself at least once (and in this case I mean it as a compliment!). This is a cute little storybook for pre-schoolers. I'm not a parent or even an aunt but this was one of the choice's in this month's Kindle First program so I picked it on a whim. I'm glad I did! The story of Lucy made me smile and the artwork was beautiful and colorful. Plus, diversity (Lucy is the daughter of a mixed-race couple). I really loved this line...simple yet lovely. The moon shone through the window, a silver veil that fell across the floor. Everything looked mysterious, even Lucy's ow This is a cute little storybook for pre-schoolers. I'm not a parent or even an aunt but this was one of the choice's in this month's Kindle First program so I picked it on a whim. I'm glad I did! The story of Lucy made me smile and the artwork was beautiful and colorful. Plus, diversity (Lucy is the daughter of a mixed-race couple). My daughter and I couldn't stop yawning while reading this book; how perfect for a bedtime story! With beautiful illustrations, which to me seem reminiscent of Steam Train, Dream Train what's not to love?! very cute. I know some people look for this so I will say it's an interracial couple, white dad and African American mom and a mixed little girl. I did reread it to count the yawns and there are, in fact, twenty. Such a wonderful story that our family can relate to. I loved watching my children smile as they made connections and had fun trying to count yawns. The soft, beautiful artwork is so inviting. This book made us so sleepy. Cute story but the best part was figuring out how the book got its title. Hello, everyone! 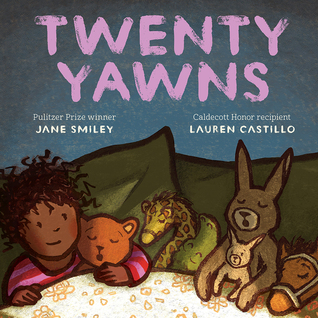 Today, we read Twenty Yawns, written by Jane Smiley and illustrated by Lauren Castillo. This is a sweet bedtime story about the sometimes-spooky time right before bed. Lucy and her parents spend all day playing at the beach, and when they all get home, they’re all very tired. Lucy’s mom begins to read her a bedtime story, but falls asleep before it’s through. Lucy is left alone in the silvery time of early night, and feels a bit spooked. She goes to find her teddy bear, Molasses, and after finding her father asleep as well, sees that all her stuffed animal friends are feeling a bit lonely and unnerved as well. As she takes care of them, she finds the courage and comfort she needs by snuggling into bed with all her plushies until everyone is yawning and drifting off to sleep. This was a cute book with a gentle sort of magic to it. It’s definitely a time of night that most remember from childhood: when everyone was asleep but you. The illustrations are adorable, and the titular twenty yawns are sprinkled throughout the book so that readers can find and count them. The length is fine for baby bookworms, and we enjoyed it. Baby Bookworm approved! Very cute simple story about bedtime. I absolutely love the artwork, and it actually kind of made me sleepy and start yawning. I actually really like the writing because I could relate to the little girl . When I was a little girl, I had some of the same thoughts being up at night when everyone else is asleep. It can get a little creepy, and I remember crawling up with my stuffed animals to make me feel better. Admittedly I might've done it a couple times as an adult too. Shh Cute! Beautiful art. I absolutely love the artwork, and it actually kind of made me sleepy and start yawning. I actually really like the writing because I could relate to the little girl . When I was a little girl, I had some of the same thoughts being up at night when everyone else is asleep. It can get a little creepy, and I remember crawling up with my stuffed animals to make me feel better. Admittedly I might've done it a couple times as an adult too. Shh, don't judge. A beautifully illustrated book about going to sleep after a wonderful day. I found the two-page spreads of Lucy with the moon and Lucy with her stuff animals in the living room to be especially profound. 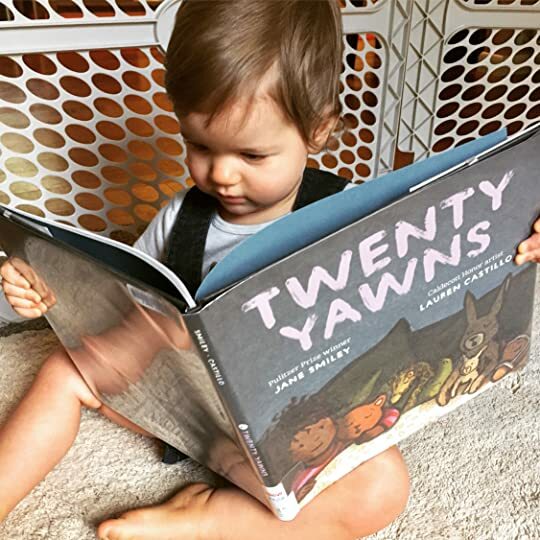 Twenty Yawns is a perfect book for bedtime, and is structured in a way that allows for audience involvement. After sharing Twenty Yawns with my daughter, I can tell this is going to be a staple in our bedtime routine for a years to come. On a separate note, I noticed the publisher of this book w A beautifully illustrated book about going to sleep after a wonderful day. I found the two-page spreads of Lucy with the moon and Lucy with her stuff animals in the living room to be especially profound. Twenty Yawns is a perfect book for bedtime, and is structured in a way that allows for audience involvement. After sharing Twenty Yawns with my daughter, I can tell this is going to be a staple in our bedtime routine for a years to come. Summary: This story is about a little girl named Lucy. Lucy spends all day at the beach with her folks. Afterward, she is super tired. Her mom and dad fall asleep early, leaving Lucy awake to yawn the night away with her stuffed animals. I would use this book to explain cause and effect. I would explain that beCAUSE Lucy and her family were at the beach all day, the EFFECT was that everyone was super tired. I would then assign a worksheet with more cause and effect practice. Smiley, J., & Cast Summary: This story is about a little girl named Lucy. Lucy spends all day at the beach with her folks. Afterward, she is super tired. Her mom and dad fall asleep early, leaving Lucy awake to yawn the night away with her stuffed animals. Smiley, J., & Castillo, L. (2016). Twenty yawns. New York: Two Lions. A simple, sweet story about a lovely day with family, this picture book for is as endearing as can be! The main character reminds me of my daughter, and in fact, I can't wait to read this to her. The illustrations give a wonderful sense of comfort and love, with softly rounded shapes, broad strokes, and textured coloring-- and I LOVE the depiction of a happy biracial family. Read this to your little ones! Cute and very warm sorry, that made me yawn twice (goal reached). The colors were beautiful, especially at the beach part, and it was very nice to have a family with ethnical diversity. The story was simple, but efficient and realistic, easy to understand for children and a pleasant read as an adult. The story feels very disjointed and lacking flow. 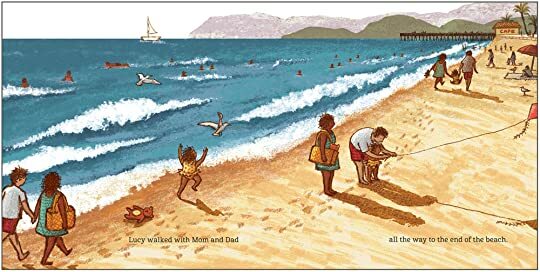 A few pages on a day at the beach (with a wonderfully mixed-race family) then the rest is on going to sleep and yawning. Cute illustrations. I think sleeping with all of the stuffed animals is a cute kid-comfort thing to do. Not sure why specifically "20" in the title. Twenty Yawns is a sweet bedtime story, and yes, I counted the yawns, and there are 20. I loved the textured looking illustrations, and the contrast between the bright day at the beach and the dim night at home. The colors of the sunset were especially beautiful. I really loved the art in this one. So sweet, so colourful. Is it a beach visit book or a bedtime book? There are two distinct story arcs here. Is it interesting, or is it sloppy writing? I can't tell. But I do love Castillo's two-page spreads, especially the sunset one. 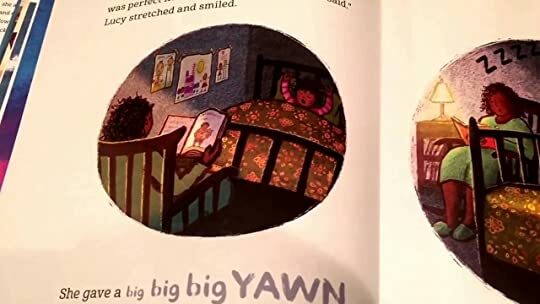 Cute book and story - but I got a little distracted looking for and counting yawns and so I needed to go back several times to see what I missed! Beautiful bedtime book. Gorgeous illustrations! An excellently contagious bedtime story!